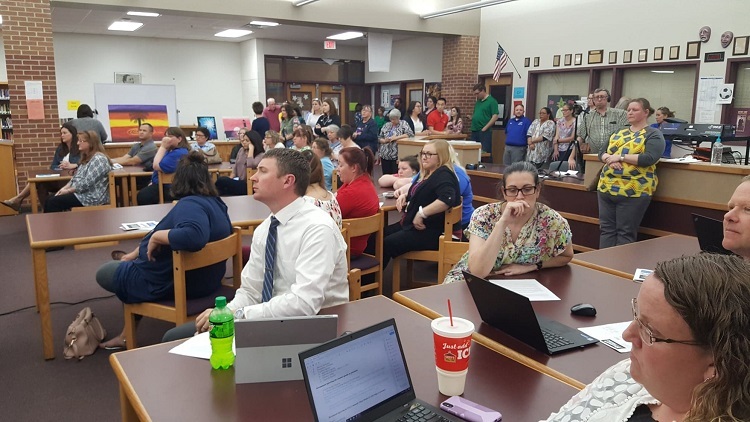 More than 100 people attended Monday's meeting of the PCSD School Board. I made the following remarks to the Perry School Board Monday night and wanted to share them with the people in the school district who did not attend the meeting. My name is Ray Harden. I taught middle school science in the Perry Schools from 1970 until 1998. I also had three daughters who attended school in Perry, from kindergarten to their high school graduation. I have a fondness for the Perry schools, and I am concerned about public education in Iowa. Negotiations, under the Collective Bargaining Law, began in the mid-1970s. During my tenure at Perry, I was a member of the negotiations team for many years. Before the Collective Bargaining Law was passed, teachers had “collective begging.” Every teacher negotiated his or her own contract, and in many instances teachers were not treated fairly. Often favoritism was shown by the administration when teachers were given raises. In some instances, teachers had to move to another school district to get a raise in their salary. Perry’s current teacher salaries are on the low side of average. Some teachers have not received a raise in two years, and some have had a pay cut. In the days before Collective Bargaining, teachers did not have a salary schedule. They could not predict their salary. A contract with a salary schedule gives a sense of security and a better feeling regarding job stability. When the Collective Bargaining Agreement was first passed, teachers gave up their right to strike and agreed to a binding arbitration clause in the law. One factor that served as impetus for getting the law passed was the teacher strike that occurred in Keokuk, Iowa, in May 1970. A good contract lets teachers feel they are being treated fairly and equally. This allows for more collaboration between the staff regarding teaching techniques and ways to deal with individual student needs. Under the old master-contract system, teachers could expect a fair and known evaluation procedure. They had a grievance procedure, and had they due process in a termination case. These items need to be in a binding contract, not a handbook. By doing away with the contract and salary schedule, the teaching profession would be set back to the 1960s. Perry Schools could expect a more transient teaching staff, which would weaken effective teaching in the Perry school system, and this would negatively affect student learning. A contract is a way to work with the teaching staff for a better school system. I have read that the current contract would be placed in a “handbook,” and there would be little change. If it is going to be the same, then why do away with the contract? But there could be changes. A brochure prepared by the Iowa Labor Center states, “Administrative staff can outline polices in employee manuals or ‘handbooks,’ while retaining the right to change the policies at any time.” This could be detrimental to the teaching staff. The Iowa Legislature has been hostile toward public education. There has been inadquate school funding by the state legislature, and two years ago they “scrapped” a 42-year-old collective bargaining agreement that was signed into law by Republican Gov. Robert D. Ray in 1975. Why? It is a law that has worked well for the teachers of Perry and the rest of Iowa. Currently some members of the lowa Legislature are trying to pass ” school vouchers,” which will continue to weaken public schools, and they are hinting at “looking at IPERS,” the teachers’ retirement program. To me this means ending the IPERS program. If the Perry Community School District eliminated the teacher contract, it wold be another assault on public education and the teaching profession. I urge the school board to continue with the current contract and the negotiations procedure that is currently allowed under Iowa law.